Okie dokie, apols for the multiple posts, as I mentioned a few blah blah blah's ago, our internet got disconnected, and we'll be waiting a while for the new service. However here I am, in the pub, this time Coldplay is on. Sorry peeps, it is very bland music. Beige tunes means better writing from me however! So, have you guys tried any Built By Wendy things? She does clothes and patterns for you to make your own stuff. But she also makes books to help you make stuff too! I've got both the straight stitch and the knit book, but I've only just used the first pattern from them today. It's one of the dresses in the knit book, and was actually really easy, and hardly took any time at all... I was amazed! I'll wear it tomorrow to work! BTW the drawings in these Built By Wendy books (Wendy btw is from the US) are by Beci Orpin, and she used to do stuff for a clothing company I used to work for in Melbs. And I was a bit surprised to see her name, and it took me ages to think why I recognised her. Yay! I have both her books as well. 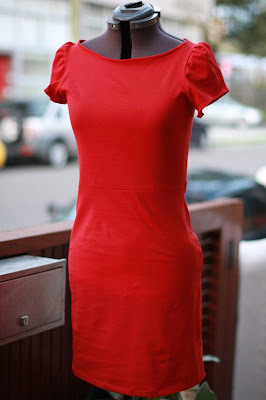 I made the strapless knit dress from the knit book. I really like how your dress turned out. Love the color too. I'm going to have to try it. I haven't tried any 'Built By Wendy' patterns, but seeing your dress could well inspire me. I haven't been to the Remnant Warehouse since they moved, mainly because we moved from the Inner West around about the same time as they moved, so slackness on my part!